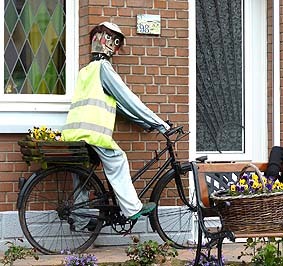 There is a jaunty scarecrow on a bicycle that was photographed in a front garden in Bailleul, France. 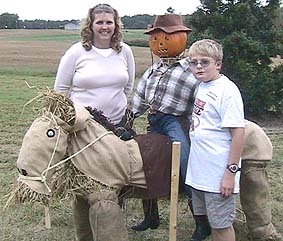 Here is a beautifully made horse and rider scarecrow created by Steve and Kay Miller of North Carolina. He really looks ready to ride off into the sunset! This wonderfully imaginative scarecrow display uses many types of sporting equipment: a basket ball for the head, ping pong balls for the eyes, a skipping rope for hair, various rackets for the body, legs and arms, and darts for fingers! 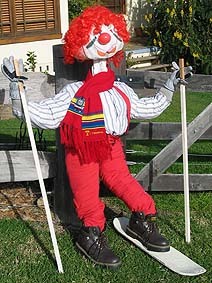 This sporty scarecrow skier came equipped with skis, poles and a ski jump. 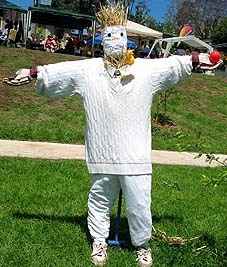 Here is a keen sporting scarecrow ready for the outdoors, built in the traditional style, all dressed up for a game of cricket. 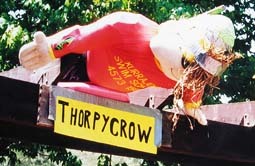 This scarecrow display was based on champion Australian swimmer, Ian Thorpe. 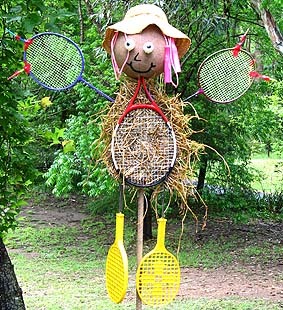 Note: This page includes sports scarecrow ideas for you and your kids to make for an outdoor recreation theme. Use your scarecrow making skills to build scarecrow athletes: a scarecrow swimmer, a scarecrow cricketer, a scare crow skier or imaginatively decorate a scarecrow using sporting equipment.